If you’re going to feed your dogs “people” food, shouldn’t you feed them something that’s actually good for them? Here are some healthy, easily obtainable options straight from market shelves that can be added to spice up your pup’s regular fare. There are, of course, a few cautions to keep in mind. First, none of these items by themselves constitutes a “complete and balanced” meal, and if your dog has health or weight issues, check with your vet before introducing them. 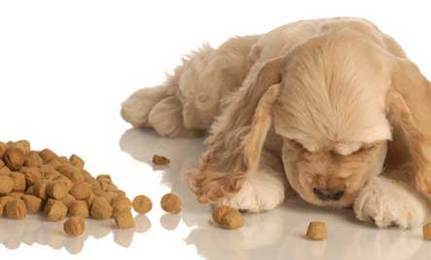 Next, considering that many dogs are willing to eat almost anything they find, they can be surprisingly fussy about new things in their food bowls; start with a small portion to see if it’s a go… or no. And finally, always introduce new foods gradually. Look for 10 more “easy pieces” in the next issue. High in potassium (great for muscle and blood vessel function as well as for regulating the acidity of body fluids), fiber (a handy home remedy for the occasional bout of doggy diarrhea or constipation) and magnesium (important for energy transport and protein building in the body). Bananas have lots of pyridoxine (Vitamin B6), which helps metabolize proteins and regulates blood cell function so the blood can bring more oxygen to the brain and muscle. They also contain Vitamin C, an antioxidant that protects cells from damage and helps build cartilage. Pup Prep: Mash a banana and mix it in with your dog’s food. Be forewarned that the compounds in bananas that make them smell banana-y are offensive to some canines. A sorely ignored veggie, similar to a turnip. Rutabagas are very good boiled and mashed. They’re available year-round in most grocery stores and keep well. Their high levels of Vitamin C, potassium and carotenoids (precursors to Vitamin A) aid eye health and maintenance of DNA activation in cells. They are also important in immune system function and have a number of lesser-known phytochemicals, which are shown to reduce the risk of several chronic diseases associated with aging. Pup Prep: Peel, boil and mash the rutabaga, then add a little bit of safflower or olive oil; these oils are not harmful to dogs, who need fats and handle them far better than do humans. Loaded with nutrients, such as the carotenoids and Vitamin C, in addition to some lesser known antioxidants and phytochemicals. They are high in pyridoxine, potassium, fiber and magnesium. They also are good sources of copper, iron and manganese–all essential minerals that perform myriad functions in cells, from transporting oxygen to assisting in the assembly of proteins. Pup Prep: As with rutabaga, boil, mash and add a bit of good oil. Active cultures known as probiotics (necessary, friendly bacteria) help keep the bad bacteria away. Yogurt, which may improve gut function, contains a number of nutrients, including protein, calcium, phosphorus, Vitamin B12, potassium, zinc and iodine. It is also a fair source of other B vitamins such as riboflavin and pantothenic acid (required for enzyme action and energy production, as well as other cellular functions). Pup Prep: A dollop of non-fat yogurt is a great way to disguise some yucky medicines. Bursting with Omega-3 fatty acids. Omega-3s do wonders for skin, coat and brain as well as limit inflammatory processes that cause arthritic pain and other chronic canine conditions. (If your dog has any of these conditions, ask your vet if fish oil in capsule form might help.) Salmon is also an excellent protein source, with many essential vitamins and minerals. * Pup Prep: When you’re cooking salmon steaks for yourself, toss a few extra on the barbie for your dog. Refrigerate or dehydrate the grilled chunks and serve them cold. Dried edible seaweed (red algae species), a Japanese staple. Often associated with sushi, nori is available in some supermarkets, and certainly in those with Asian food items. It has protein, galactans (a soluble fiber), Vitamins C, E and all the Bs, and minerals such as zinc and copper. It also contains some lesser-known sterols and chlorophyll, which have been investigated for their effects on regulating metabolism. Nori may have beneficial effects on fat metabolism, immune function and anti-tumor response. Pup Prep: Nori does not have a strong odor or flavor, and the paper-thin sheets can be torn and soaked in broth, then added to food, or just added dry. Puppy sushi, anyone? Member of the Heath family and loaded with phytochemicals. Available year round either fresh or frozen, blueberries are a great treat for your dog. The deep blue color comes from anthocyanidins, which are potent antioxidants, and the berries also supply Vitamin C, Vitamin E, manganese and fiber. Slow introduction in small quantities is particularly essential here; as anyone who has ever gorged on this tasty fruit knows, the blueberry “trots” are most unpleasant (and you’re the one who will be cleaning up!). Be judicious. Pup Prep: Rinse and serve whole, or mash lightly. Aromatic mint relative. Rosemary provides some fiber, iron and calcium in addition to several phytochemicals thought to improve immune function and act as anti-inflammatory agents and antioxidants. Pup Prep: Wash a sprig of fresh rosemary and add the minced needles (leaves) to foods. A pretty veggie known as a “green.” Chard belongs to the same family as beets and spinach and has tons of nutrients, which are best maintained by blanching and not boiling the leaves and stalks to mush. (Some feel that, in order to lap up any leeched nutrients, the water in which chard is blanched should be consumed too.) Blanching sweetens the leaves and frees up some of the oxalates, which can bind minerals. Chard’s nutrients have the potential to maintain bone health, blood vessel integrity, eye health and immune function and benefit optimal muscle function and energy production. Pup Prep: Offer your dog some blanched, chopped chard enhanced with a bit of olive oil; if you’re lucky, your best friend will want the blanching water too! *The Environmental Protection Agency (EPA) monitors the levels of mercury and industrial chemicals that end up in fish, both fresh- and saltwater; updates regarding contamination are readily available. The Bark is the award-winning magazine of modern dog culture—it speaks to the committed dog enthusiast—and is the indispensable guide to life with dogs, showing readers how to live smartly and rewardingly with their canine companions. Bark is the recognized expert on the social/cultural world of dogs in America, and what they mean to us. Click here for your FREE issue.